As much as I love weekends, it's a really good thing for my waistline that I don't have time to bake like this every morning. There's something about waking up early and having time to peruse the recipes I've set aside, check the shelves to see what's around and set about making something delicious for breakfast. I just love it. And given the time, I would probably do it every morning. I found these little numbers through America's Test Kitchen. I've never made one of their recipes before, but after trying these, I plan to make many more. They were absolutely delicious. I changed up the recipe slightly by using light sour cream and subbing out walnuts for pecans (since that's what I had on hand). Use whichever nuts you prefer. 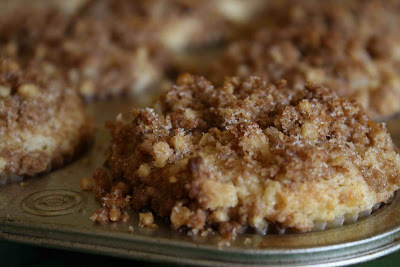 Place the brown sugar, flour, cinnamon, butter and 1/4 cup of the sugar in a food processor and pulse until crumbs form. Scoop out 3/4 cup of mixture and set aside (this will be your cinnamon filling). Add remaining 1/4 cup of sugar and the walnut pieces and pulse until nuts are coarsely chopped. Set aside for your topping. Mix the eggs, vanilla and sour cream together. Place the flour, sugar, baking powder, salt and butter in a food processor and pulse until crumbs form. Use a spatula to gently fold the dry and wet ingredients together. Do not over mix. Spray a muffin tin with cooking spray and line with muffin liners. Place 1 T of batter in each muffin cup and press to cover the bottom. Next add 1 T of cinnamon filling, pressing into the batter, and then cover with more batter until all the batter is used up. Sprinkle 2 T of topping over each of the muffins and press gently into the batter. Bake for 22 - 24 minutes and let cool for 10 minutes before serving. Enjoy! I totally know what you mean! I love having time on the weekends to bake something yummy for breakfast. Those muffins look delicious. Oh boy that crumb topping is calling my name!! YUM! OK - I may nix the suggestions that everyone else made and try these first. OMG - yum! These seem like a perfect Sunday morning treat to enjoy with a cup of tea or coffee. Good choice with the pecans, they are my favorite! Great recipe for fall! And the cookies below look great. Cookies are my favorite thing to bake...I always bake too many and eat too many though! These muffins look great. The topping sounds sinful. ATK has great recipes... I love their recipe for chicken biryani. These look so delicious. I am so glad I found your blog, we seem to have the same style in cooking and baking. Do you think I could use Pure vanilla instead of the paste?